THE Wey & Arun Canal Trust is once again giving the opportunity for people to explore is route in its annual sponsored walk. The Trust is offering a day discovering little known traces of the former Portsmouth & Arundel Canal. 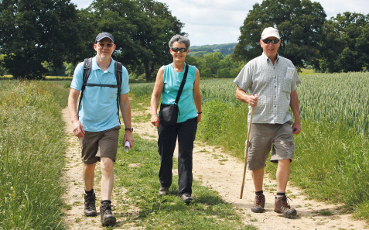 This annual walk for charity is being held on Sunday 3rd June and starts from Walberton Village Hall. The 12 mile route takes in Binsted, the banks of the rivers Arun, Ford and Yapton before returning to Walberton to collect cars. Walkers will get a glimpse of canal structures that can be seen along the way including being taken under a buried canal bridge hidden in a new housing estate, and another one in Yapton and there is a refreshment stop by the site of the Hollingworth swing bridge. The original Portsmouth & Arundel Canal was opened in 1823 but was abandoned in 1855 never having been a financial success. The canal was part of a larger scheme for the construction of a secure inland canal route from the Thames in London to Portsmouth, which would allow craft to move between the two without having to venture into the English Channel and possibly encounter enemy ships or natural disaster. It formed the southernmost half of the waterway link of which the Wey & Arun Canal formed the northern route from the Arun at Pallingham, north of Pulborough, to Shalford, the Wey and hence London. The waterway was 28 miles long and passed through six locks, two of which were at Ford to take the waterway from the Arun on to its inland route. All you need to take part is download a sponsor form (lunch and refreshments are included) and ask a few friends to sponsor you for the day. There is also the possibility to participate in only the morning or afternoon. Registration starts at Walberton Village Hall (The Street, Walberton, Arundel BN18 0PJ) between 9-11am to check in and get the walking guide. See https://weyarun.org.uk/poddle for further details. If you don’t want to walk, but would like to support this local charity, personal donations can be made via their website to sponsor the last walker.